That is how dynamic were Davis Love III and Fred Couples in March and April that year. Sadly, Tennyson had died exactly 100 years earlier so he wasn’t witness to Love and Couples winning three times each in a stretch of nine PGA TOUR tournaments. It might have been poetic inspiration for Tennyson — especially after Love, having been edged by Couples in Los Angeles four weeks earlier, roared to a memorable four-stroke victory at THE PLAYERS Championship. They would be 1-2 in both the Player of the Year and money list categories in 1992 (Couples edging Love in each instance), but at THE PLAYERS Stadium Course at TPC Sawgrass Couples was no match for Love’s exhilarating 5-under 67 on Sunday. A pitch-in birdie at the par-3 eighth and a 30-foot birdie roll at the par-4 10th fueled Love’s fourth-round heroics. But another sub-plot dominated the 27-year-old’s win. That being a family affair. Still hurting over the 1988 death of his father, Davis Love III played in front of his mother, his wife and young daughter, and had his brother, Mark, on his bag. “I felt like I needed a friend and a teacher,” Davis said of Mark. Couples had set a course-record 63 Saturday to get within one of Love, but never got closer. This time, THE PLAYERS was truly a Love story. 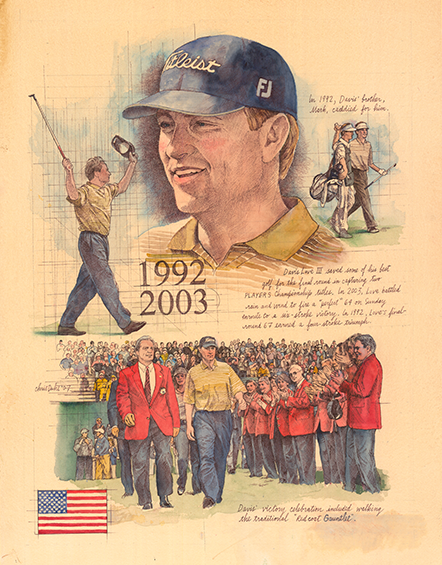 Perhaps unknown to the masses at the time, Davis Love III rose to golfing prominence and the consciousness of fans around the world with a final-round 67 to finish 15-under-par and win THE PLAYERS Championship. At the Island Green, where so many dreams have been crushed, Love III saw his ball roll to within five feet of the stick, which secured him the win.